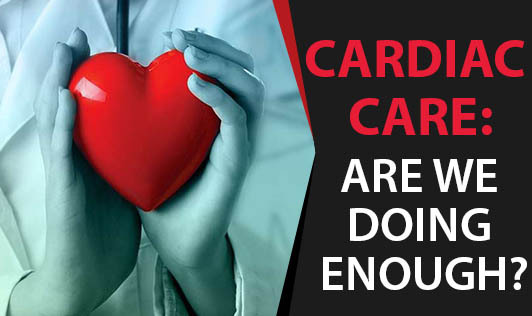 Cardiac Care: Are we doing enough? While the incidence of coronary artery disease is gradually coming down in the developed nations, it is steadily and alarmingly on the rise in developing nations, particularly India. It is now well established that heart disease can be prevented in most cases. Changing lifestyles and urbanisation have been blamed for this killer disease. Are we doing enough to prevent this monster from becoming the number one killer in India? Much research and review has gone into finding out the cause and risk factors. Earlier, we believed that death due to heart attack was god's will. Now, we know that if we have the will, we can find the way to avoid heart disease from killing us. While total cholesterol was considered a huge risk factor for heart disease, many others - poor eating habits, high triglycerides, stress, sedentary lifestyle, insulin resistance, central obesity, etc. - emerged as co-risks. Fortunately, most of the risk factors for heart disease are within our control and can be modified with our lifestyle. Maintaining normal levels of weight, body fat, body mass index, waist to hip ratio, blood pressure, blood glucose and blood lipids are good ways of preventing heart disease. Eating sensibly, exercising regularly, managing stress and not smoking can achieve this. The prevention process should ideally begin in childhood, perhaps even in the womb. Studies done in relation to foetal origins of adult disease have shown that mother malnutrition during pregnancy can increase chances of adult diabetes and cardiovascular diseases. Young adults too are now increasingly showing risk factors. A survey done in one of the companies in Bangalore showed that about one-third of them have higher than normal blood pressure at an average age of 30. The consequences of losing young working men to heart attacks can be disastrous, particularly to their families. Are we teaching our children to lead healthy lifestyles? Are employers paying attention to preventive healthcare for their employees? Are we providing adequate information to the public about preventing heart disease? The answer to the upcoming explosion of heart disease lies in early prevention and lifestyle intervention.